The demand within the global market for smart manufacturing has been rising on account of the recent trend of attaining optimal industrial productivity to make businesses lucrative. Smart manufacturing has pervaded across multiple industries and is projected to overhaul the business landscape in the years to come. Smart manufacturing refers to the use of computerised systems and key manufacturing technologies in order to enhance the agility, quality, and speed of manufacturing. Furthermore, smart manufacturing is substantially different from traditional manufacturing in the sense that the former involves workforce training and concept transformation to bring about product transaction. Traditional manufacturing methods involve customary usage of raw materials to develop final products while smart manufacturing is a more customised approach that focuses on the detailing of products. The contemporary scenario has witnessed several digital transformations and solutions come under the spotlight of attention, which has aided the growth of the global market for smart manufacturing. Several research organisations have vindicated the use of smart manufacturing by stating that there is minimal production of waste when digital technologies are used for manufacturing. The growth of manufacturing units within several sectors and industries is projected to bring about positive growth within the global market for smart manufacturing. Transparency Market Research (TMR) finds that the global market for smart manufacturing would expand at a stellar CAGR of 13.2% over the period between 2016 and 2024. Furthermore, the global market for smart manufacturing is prognosticated to touch a value of US$548.14 bn by 2024, elevating from a total worth of US$159.05 bn in 2015. TMR’s report on global smart manufacturing market elucidates a number of factors that underpin the growth of this market. The global market for smart manufacturing can be categorised on the basis of end-use industry into the following: Defense and aerospace, automotive, food and beverages, pharmaceuticals, and consumer electronics. Amongst these key segments, the demand for smart manufacturing has been the highest in the Defense and aerospace sector due to the need for customisable and quality-controlled equipment. Furthermore, the Defense and aerospace sector influences economic growth of nations which also calls for a robust system of smart manufacturing within the industry. On the basis of technology type, the demand for enterprise resource planning and supervisory control and data acquisition has been rising at a robust rate due to the need for connecting industrial processes to a central console. Other key segments within the technology type categorisation are distribution control system, human machine interface, machine vision, manufacturing execution system, programmable logic controller, and other technologies. The demand for smart manufacturing in the US and Canada has been scaling new heights due to the sophisticated nature of the industrial sector in these countries. The governments in these regions have been focusing on creating a digital framework for the manufacture of products and equipment across a wide array of industries. Furthermore, the expansive industrial sector and the swift manufacturing in Europe and Asia Pacific are expected to drive demand within these regional markets. Some of the key players in the global smart manufacturing market are ABB Ltd., Emerson Electric Company, Johnson Controls, Inc., Honeywell International, Inc, and Siemens AG. On the basis of various technology types, the smart manufacturing market is segmented into programmable logic controller (PLC), manufacturing execution system (MES), distributed control system (DCS), enterprise resource planning (ERP), human machine interface (HMI), supervisory controller and data acquisition (SCADA), machine vision (MV), and other technologies. In the technologies segment, the enterprise resource and planning segment constituted the biggest market share, followed by the manufacturing execution system segment, in 2015. Enterprise resource and planning is largely used in automation, oil & gas, fishing, retail, media and entertainment, and military. 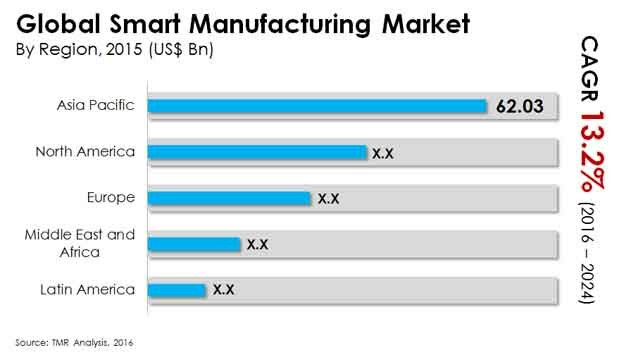 Therefore, the segment generates the largest revenue among all the segments in the smart manufacturing market. In addition, it is ideal for producing digital services. Manufacturing execution system follows enterprise resource planning, and is one of the most widely used smart manufacturing technology to assimilate production operations across several layers comprising maintenance. MES can be particularly significant in structured industries such as food and beverage, and can document and track the evolution of raw materials into finished goods.